This year’s Knight Batten Awards for Innovation in Journalism are now open for entries. According to guidelines from organiser the J-Lab Institute for Interactive Journalism, the awards recognise “pioneering approaches to news and information” and those entering can submit “journalism content, new journalism processes or ideas, or tools or new applications that promote the information needs of communities and/or enhance digital engagement”. The contest is open to all news efforts originating between 1 May 2010, and 6 June 2011. The winners will be announced at the Knight-Batten Awards Symposium in September 2011, at the Newseum in Washington, D.C.
Last year’s grand prize was won by Sunlight Live, an offshoot of US non-profit and think tank the Sunlight Foundation, after it was used to livestream video and aggregate content around a major US healthcare summit. This entry was posted in Awards, Data, Niche, Online Journalism and tagged communities, Digital News, J-Lab Institute for Interactive Journalism, Knight Batten Awards on May 20, 2011 by Joel Gunter. A correction from Monday’s edition of Australia’s Morning Bulletin. I’m pretty sure that it’s my favourite correction of all time. Hatip: @substuff on Rantings of a sub-editor. 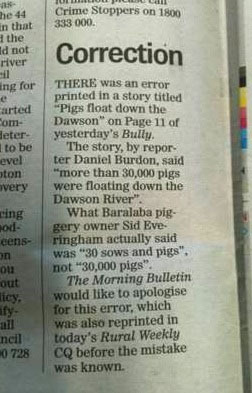 This entry was posted in Editors' pick, Niche and tagged Funny, pigs, the morning bulletin on February 11, 2011 by Joel Gunter. The Financial Times has launched a new subscription-only website focusing on Brazil’s finance, government and industry. Brazil Confidential provides research and analysis of trends in the Brazilian market, Media Business reports. This entry was posted in Newspapers, Niche, Online Journalism and tagged Brazil, finance, The Financial Times on February 7, 2011 by Paul McNally. This Wednesday at 6:30pm, “people from around the world” will reportedly “commence dining” in what appears to be a fundraising initiative from under-siege whistleblowers’ site WikiLeaks. All you need to do to join the party is make a donation to the site. And there is more bang for your buck than just dinner, you also get a password to play a video message from Julian Assange. After you have filled out our pledge form you will be given a password (keep it safe!). The password will unlock a video for you to play at your dinner that will be available from 6.30pm GMT. Check out this rather snazzy website for more information. This entry was posted in Editors' pick, Niche, PR and tagged fundraising, julian assange, Wikileaks on February 7, 2011 by Joel Gunter. Make a connection with your audience and harness the power of focused communities around your niche, media groups advised publishers during a panel discussion on how B2B publications can benefit from and offer value to their readers. John Barnes MD of digital at Incisive Media said B2B publishers have to understand who their audiences are. It’s about identifying a type of focused audience … and understanding what the role, function, value and importance of that individual is so we can sell that focus to advertisers. We have lost sight of that in some of the market as we have been chasing eyeballs instead. He added that the way forward with this thinking is to create an environment where “it is the most natural thing in the world to hand over details”. It’s about having the environment to encourage sharing … if we haven’t got that we haven’t got a media business. Mike Butcher, editor of TechCrunch Europe which was recently bought by AOL, added that the chase for communities is historical in the publishing industry. We didn’t chase registrations, what we chased was communities. If you look at what publishers have done historically … in the first instance it was to chase communities. They didn’t necessarily have data about them but they chased them and enlightened those communities. In fact he said TechCrunch’s focused community was key to its value for AOL: “it was bought for this high value community”. Tim Potter, managing director of business publishing at Centaur Media added that community focused platforms such as blogs when used within media brands will encourage high interaction. If you give people blogging tools within our existing media brands you get a very high level of interaction, even in markets where you wouldn’t expect it … it will take a lot for a blog to come along and challenge established media brands providing they do the right things. But as long as the publisher continues to provide informed content, he added, it will remain “central to the debate”. Kevin Eyres, managing director for LinkedIn Europe added that the value of the individual must also be remembered by brands. It’s about not losing sight of humans. When you’re talking about B2B it’s a business person purchasing from another business person. Companies are leveraging their best assets – their employees – to make that more personal connection back and forth with whoever that purchaser is going to be. This entry was posted in Business, Events, Niche and tagged aopsummit, b2b media, Niche on October 15, 2010 by Rachel Bartlett. Hyperlocal – what does it mean? Not long ago it was the buzzword of the media and news industry – but what does ‘hyperlocal’ really mean today? It’s a question Guardian Local editor Sarah Hartley has sought answer on her blog, putting forward ten characteristics which represent the meaning of the phrase as it evolves. First, she discusses the growing range of the term, which has developed from a postcode-focused news patch to now being used to describe focused subject matter, story treatment, or even geographical areas which are actually large in size. “Can these things be considered hyperlocal in nature?”, she asks. Small is big. Scale is not important, impact is. Medium agnostic. Use of different platforms. Obsessiveness. Sticking with a story. Readers are invited to comment on her blog on whether it is time to find an alternative to the term ‘hyperlocal’ or whether it is well used enough to keep. This entry was posted in Editors' pick, Hyperlocal, Local media, Niche and tagged guardian local, Hyperlocal, Local newspapers, Online Journalism, Sarah Hartley on August 25, 2010 by Rachel Bartlett. Robots to replace sports journalists? The BBC College of Journalism reflects on the news that researchers in America have created a computer which can “autonomously” write sports articles based on a set of statistics. According to an article on the RobotShop blog, the machine, called ‘Stats Monkey”, relies on commonly-used phrases in sports journalism to form its own reports. It can produce a headline of a particular game in only 2 seconds without spelling or grammar mistakes. Stats Monkey independently looks for websites specialised in match statistics, scores, goals, major events and even photographs. To write its article, the journalist robot uses pre-recorded forms of expressions that often come up. But – BBC CoJo asks James Porter, the broadcaster’s former head of sports news – does this mean the end for sports journalism? It’s certainly a wake-up call, he says. In America the way sports is covered and consumed is very statistics driven. Anything a player does is presented to the audiences in the form of statistics. I’m not so sure it’s applicable in the UK (…) It’s a wake up call to us to make sure our journalism concentrates on the stories and the excitement around sport and lifts itself out of the mundanity that otherwise we do sometimes descend into. This entry was posted in Editors' pick, Niche and tagged BBC College of Journalism, computer journalism, RobotShop blog, sports journalism, Stats Monkey, technology on August 13, 2010 by Rachel Bartlett. This series of 10 moneymaking tips for journalists began on Adam Westbrook’s blog, but continues exclusively on Journalism.co.uk from today. Adam’s e-book, Next Generation Journalist: 10 New Ways to Make Money in Journalism is on sale now. Here’s a key thing about the Next Generation Journalist which separates them from the rest of the crowd: they have more than one stream of income. This is a new way of adapting to freelancing life in the 21st century, where journalists need to be more than a sole traders pitching ideas to every editor in town. They should be their own business, with their own brand and a multitude of revenue streams. The Portfolio Career, or as some call it in other fields the Renaissance Career, was much more difficult before the internet. The web makes it easier and cheaper both to set up a business and to maintain more than one. The web has also made it easier to develop a passive income: the right business ideas can bring in money without a proportional amount of work. A portfolio career is a great option for journalists because it enables us to use our different skills in different ways. I know radio newsreaders who have a sideline doing voice over work, a reporter who designs websites in her spare time; there are journalists who teach, train, lecture and sell stuff online. To make this work you’ll need a good brand and a good portfolio presence on the web, two things covered in detail in Next Generation Journalist. It’s something young people are already familiar with. A survey called Creative Graduates, Creative Futures published in January 2010 questioned 3,500 UK students on creative or media courses: 48% of them had already developed a portfolio career, while studying! To find out more about Next Generation Journalist: 10 New Ways to Make Money in Journalism – click here. This entry was posted in Business, Jobs, Niche, Training and tagged #nextgenjourno, Business, entrepreneurial journalism, next generation journalist, portfolio career, revenue streams on May 20, 2010 by Adam Westbrook. This series of 10 moneymaking tips for journalists began on Adam Westbrook’s blog, but continues exclusively on Journalism.co.uk from today. Adam’s e-book, Next Generation Journalist: 10 New Ways to Make Money in Journalism will be available to download in full on 20 May. OK, so setting up a hyperlocal blog is hardly a new way to do things in journalism. But making money from it is pretty new and, seemingly, still pretty rare. In the UK for example, only a handful of hyperlocal blogs, such as Ventor Blog, SR2 and SE1 are getting the sorts of eyeballs and ad revenue to make a living. Thing is, hyperlocal is an important and (if done correctly) profitable niche for the next generation journalist; we’re just not going about it right. Setting up a blog, writing loads of local content and hoping to bring in local ad revenue alone is a tough gig. At first you’re unlikely to get the hits you need to bring in enough cash. Google Adwords is becoming something of a byword for false promises of cash among website owners. If you want to maximise your advertising revenue, a product like Addiply is a really good bet, and is it seems to be bringing in better results for those who use it on a local level. 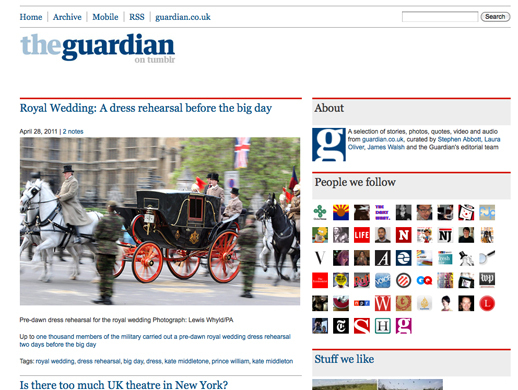 Advertisers could expect to pay around £30 a month, although it varies from site to site. But I really think for a hyperlocal website to work – in fact, for any web based content product to work – the ultimate aim must be to make ad revenue as small a slice of the pie as possible. The less your business relies on ad revenue, the less vulnerable you are to the inevitable ups and downs of the market. Have a look at yesterday’s post on my blog, where I talk about a local news success story – thebusinessdesk.com. Set up by David Parkin, it now has three regional business sites in Yorkshire, the North-West and Birmingham. Parkin told last week’s Local Heroes Conference he expects to turnover £1 million this year. Where does the money come from? Ad revenue yes, but that’s only a part of it. Firstly, thebusinessdesk.com has a niche (local financial news) and a wealthy target audience (business people). It has a mailing list of 37,000 subscribers who get a daily email of business news, which is sponsored. They have an iPhone app and run events. It’s a successful model – and one which needs to be employed by hyperlocal bloggers. Don’t just process listings, and re-write press releases; become a major part of your community. Become a leader in your community. Be the voice for those whose voices don’t get heard. Run regular events so you can meet readers face-to-face. Run pub quizzes and pocket the profits. Sell products, take a slice of restaurant bookings through your website, charge for listings. Don’t just maintain a website – build a mailing list and send them news direct to their inbox. Get that mailing list sponsored by local businesses. If you’ve got any good stories about how you’re making hyperlocal work, I’d love to hear them. Interested in niche and hyperlocal? Looking for new ideas for specialist journalism? Attend Journalism.co.uk’s upcoming event: news:rewired – the nouveau niche. Follow the link to find out more. This entry was posted in Business, Hyperlocal, Niche and tagged #nextgenjourno, Adam Westbrook, Addiply, entrepreneurial journalism, Hyperlocal, next generation journalist, Niche on May 19, 2010 by Adam Westbrook.